Some Dubai residents may have noticed something rather unusual in the sky. No, it wasn’t Superman – it was ‘Jetman.’ Yves Rossy and his partner soared into the skies above the desert cranking up to 300kph, with just a jet pack for propulsion. Rossy, a legendry aviation enthusiast, has begun to bring his protégé, 31 year-old skydiver and base jumper Vince Reffet, in on the action. The adrenaline junky is only the second person to have been given the honor of flying with Jetman wings. 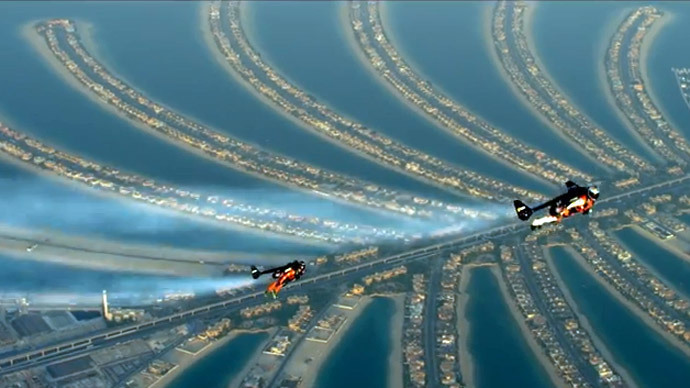 “It is the first time that two guys [have flown] in formation like that – like birds, but only with body movements. The average speed when we are going straight is about 200kph. While we are descending, we can go up to 300kph. It’s quite fast – it’s like the maximum speed of a biker,” Rossy said, speaking to RT. During his career, Rossy has used around 15 different jetpacks that he designed himself. His current pack weighs over 50 kilograms, with flights lasting around 15 minutes. “The equipment that we are using is a rigid wing that has four turbine engines, which allows us to fly pretty much where we want. We are controlling everything with our body,” Rossy added. Rossy says he is able to cover around 50 kilometers while in the air, after jumping out of a plane at a height of 2,100 meters. He then starts free falling to gain speed, before operating the jetpack to fly wherever he wants.